Kathy told Joanne that she would be late. Who would be late? Kathy or Joanne? This group of pronouns includes personal pronouns, reflexive pronouns, and demonstrative pronouns (see Lesson 3.6). Possessive adjectives (my, your, his, her, etc.) are sometimes classed as pronouns, maybe because they look similar to certain personal pronouns, but they are not pronouns – they do not stand in place of a noun, but rather come before a noun (like an adjective) to define the owner of a particular thing. I like living in Barbados. He knows a lot about Physics. 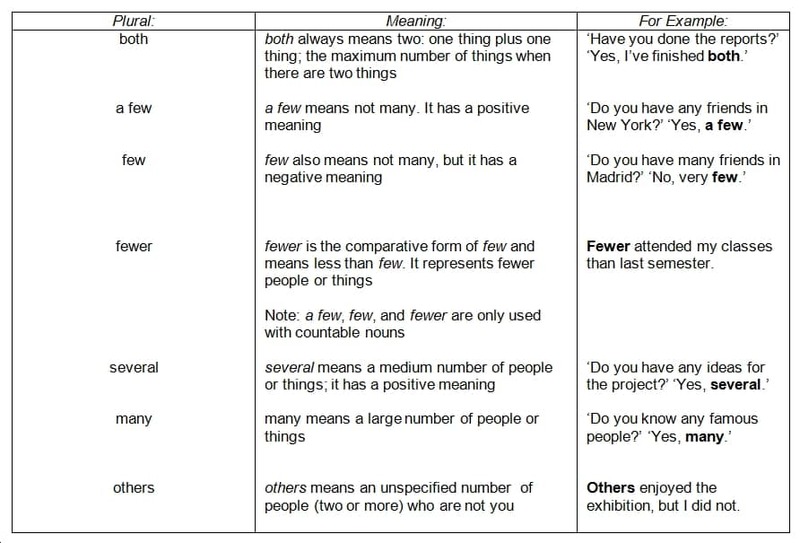 There are four demonstrative pronouns in English: this, that, these, and those. We use them to indicate the distance – in space or time – between the speaker/writer and the noun. They define which noun you mean, for example: ‘This book is mine, and that is yours.’ They are discussed in more detail in Unit 3.6. 4.3.5 We use interrogative pronouns to introduce a question, e.g. ‘Who did you meet yesterday?’ See also Lesson 4.1 Wh- Questions. 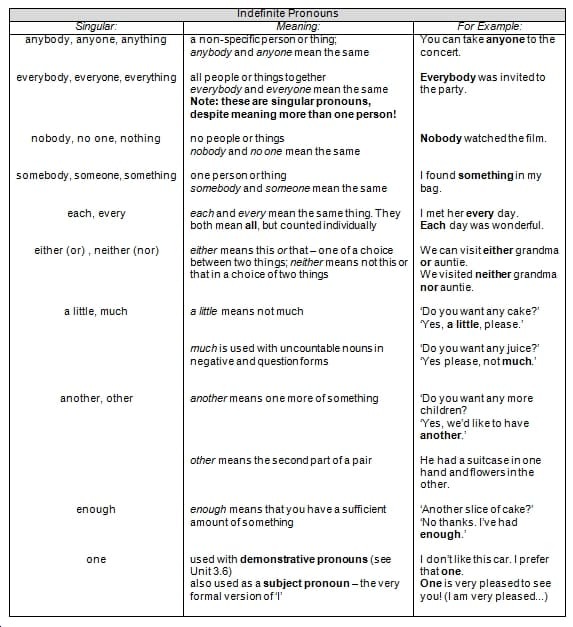 4.3.6 Relative pronouns are used to join two ideas in a sentence, with the second part giving extra information about the first. John in the solicitor who I met yesterday. John is the solicitor that I met yesterday. This is Tony, whose brother plays in the school band. These are the photos which I took last week. These are the photos that I took last week. That is slightly less formal that which. Things do not usually have things that belong to them, i.e. possessive relationships, so we don’t need to use whose. My dog Bella, who I love, is about ten years old. This is Bella, whose blanket is over there. My cats, Tricky and Dicky, really love each other. When the bus arrived on time, everybody looked at one another in surprise! Why should we use weak forms? 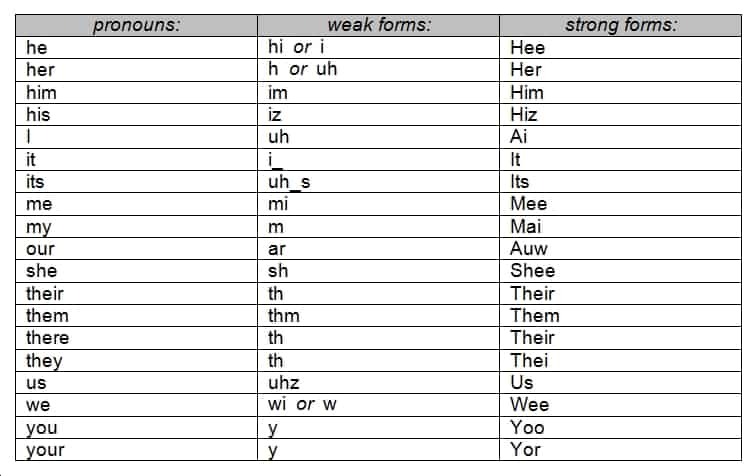 If we use strong forms instead of weak forms, our speech will sound too formal and it will be more difficult for the listener to understand what we say, because they are listening our for the stressed vowel sounds. If every vowel sound is stressed, then none is! The end result is that the level of communication is reduced. However, if a function word comes at the end of a sentence we usually use its strong form, rather than its weak form, e.g. “What are you looking for?” ( for ) or, “Who are you writing to?” ( too ). Also, if we want to show emphasis or contrast, we can vary the intonation by using strong forms where we would normally use weak forms, e.g. “What did you think of the book?” ( yoo ). See Lesson 6.2. Give that book to ________________ . ________________ don’t like working in shops. Does your friend know ________________ ? ________________ and Ted are going out for lunch. ________________ need to ask you something. ________________ was the first one to finish my exam. This is a picture of ________________ and mum on holiday. This is the house they showed ________________ . Did you know that ________________ live in Manchester? Jenny told ________________ that you went to London last week. ________________ will see you soon. Deepak is older than ________________ . Call ________________ when you get there. This is the house where ________________ was born. My colleague forgot to leave the documents for _______________. Tommy told me to book the plane tickets _______________. Can you tell _______________ what happened, please? I gave them a lift in _______________ car. It was _______________ decision to get a divorce. Alison forgot her guitar so I lent her _______________. I need to weigh _______________. _______________ don’t know how to play the piano. All the pictures on the wall were _______________. I usually make _______________ something to eat when I get home. Please tell Joanne that those dolls are _______________. Theresa asked _______________ for advice. _______________ ’m going to the shops in a minute. Is that red car _______________? Take good care of _______________. I put _______________ sandwiches in my bag. Your teacher was looking for _______________. If you want some crisps you can buy them _______________. This plate is mine and the blue one is _______________. Don’t lose _______________ keys, will you? I’ll give _______________ a lift to work tomorrow. Pete made two coffees. I’ll leave _______________ on the desk. Please try to control _______________, Alan. Do _______________ like pop music? ________________ always goes home early on Tuesdays. I asked ________________ for some help. ________________ was always a bit quiet. That’s easy for ________________ to say. Do you want to see ________________ now? ________________ needs a new pair of shoes. I think that ________________ is really selfish. Can you ask ________________ ? ________________ wasn’t very well last week. ________________ put on his coat and went out. Gillian gave the largest piece of cake to ________________ . I love spending time with ________________ . Everyone told ________________ to be quiet. There’s something strange about ________________ . _______________ has just told me what you said. The zookeeper took _______________ uniform out of the locker. I showed _______________ my new smartphone. I didn’t like _______________ performance. _______________ went home two hours ago. He finds it nearly impossible to cook for _______________. We both follow _______________ on Twitter. The money on the table was all _______________. Spanish is not _______________ first language. A: Which film won best picture? B: _______________. After arriving, George introduced _______________. ________________ thought he was joking. ________________ has got long hair. I see ________________ on the bus every day. John called ________________ at half past nine. Sally’s sister gave ________________ a new jacket. I know ________________ studies English. ________________ ’s quite serious, isn’t she? ________________ ’s not interested in geography. That guitar belongs to ________________ . Is ________________ going on holiday with you? ________________ waited in the rain for half an hour. I told ________________ that you can’t meet ________________ . ________________ picked up the bag. My neighbour said that ________________ wasn’t coming. Ask my sister if ________________ saw him. _______________ likes reading and rock climbing, but not at the same time! The problem was with Laura _______________, not anybody else. She won’t say why _______________ left Gerald. Mrs Lyndhurst usually washes the curtains _______________. The decision about quitting her job was entirely _______________. I was talking to _______________ for about half an hour. _______________ is upstairs getting ready. Those earrings don’t really suit _______________. _______________ mum lives in Barnsley. Alison rang _______________, but she didn’t pick up her phone. I borrowed _______________ car yesterday. I love your article, but I can’t stand _______________. Last night was _______________ first time playing with the Philharmonic. That isn’t my bag, it’s _______________. Sally promised _______________ that she would finish the course. They don’t believe ________________ . Will ________________ be able to meet up? This is what ________________ wanted. They saw ________________ walking down the road. Tell ________________ what you mean. ________________ hope that you enjoy yourselves. Can ________________ tell you tomorrow? ________________ don’t want to go out. This puts ________________ in a difficult position. That’s impossible for ________________ . ________________ ’ll do what ________________ can. Thank you for inviting ________________ . That’s _______________ in the photo – behind the gate. The science experiment that went wrong had to be _____________, didn’t it? _______________ ’ve been waiting for you here all day. We painted the whole wall _______________. It’s _______________ turn to play on the tablet! Dora put her song online, so I’ve uploaded _______________ too. On Tuesday _______________ ’re going to Cromer. We had taught _______________ to read German. The football coach never picks _______________. _______________ hope you have a good birthday. I don’t know where _______________ taxi has got to. Snow was falling all around _______________. _______________ tent has got a hole in it. The best argument in court was _______________, in my opinion. We surprised _______________ by coming first in the race. I don’t know ________________ at all. Who is that man with ________________ ? ________________ went to the cinema with Linda and Rachael last night. Please tell ________________ that ________________ are early. Somebody wants to see ________________ . I will put ________________ on the waiting list. ________________ are at the football match. Did ________________ see you there? I’ve never heard of ________________ . I want to invite _______________ , but I think ______________ are busy. ________________ cut the grass, just like I asked ________________ to. It was kind of ________________ to say ________________ would help. What colour curtains do ________________ want? _______________ will discuss the problem with you tomorrow. I didn’t hire these DVDs – the twins borrowed them ______________. Please pop _______________ in the post box on your way home. The birds on the bird table are feeding _______________. They’ve taken _______________ brother to the beach for the day. _______________ didn’t allow Jamie to use the photocopier. Annie and Charlie were watching _______________ favourite programme. I saw _______________ coming out of the cinema. I thought _______________ had never eaten Italian food before. Can you remember whether these books are _______________? The horses were prancing in _______________ field. This is our pie; I’ve left _______________ over there. Our bosses put together the training programme _______________. The fault was entirely ________, because they failed to buy a parking permit. Have you seen my dad? ____________ ’s wearing a red shirt. Are ____________ going to finish your dinner? I don’t like Christopher. ____________ really annoys ____________ . Your bag is over there. Take __________ with __________ when you go. We always go to bed early. Ten o’clock is late for ____________ . Her shoes were dirty, so ____________ cleaned ____________ . I’m going to the cinema. Do __________ want to come with __________ ? My brother rang last night. __________ was great to talk to __________ . Emily saw ____________ at the restaurant. They were having lunch. The boy came up to ____________ and took my hand. I don’t think the shop is open. ____________ usually closes at five thirty. I showed ___________ my photos. He thought ___________ were boring. Ben isn’t coming to see the film. ____________ ’s seen ____________ already. It’s sunny today, isn’t ____________ ? I went to see my aunt. ____________ was pleased to see ____________ . It’s good to see ____________ all. Thanks for coming. Lara’s boyfriend has broken up with ____________ . ____________ told ____________ that ____________ doesn’t love her any more. ____________ were annoyed when their meal was late. Adele said goodbye to her brother. She was sad to watch ____________ go. Ex. 4.3.14 Reading Add pronouns and possessive adjectives to the following sentences. 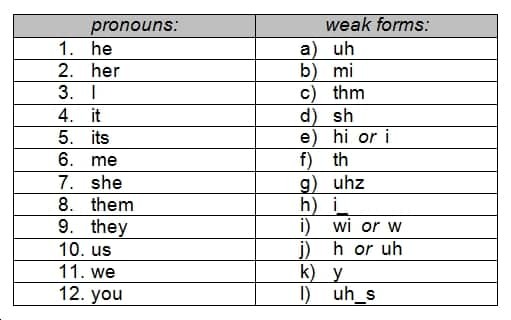 Say what kind of pronoun each one is. Note: There may be more than once correct answer! ____________ mum lives with ____________ new partner in Brighton. ____________ daughter is playing with ____________ cousins. Jenna’s aunt and uncle visited ____________ in May because ____________ wanted to see ____________ new baby. ____________ sister was walking to the city museum with ____________ children when ____________ saw a fox. ____________ son has decided to go on holiday to Florida next year by ____________. ____________ grandma and granddad should think about moving into a retirement bungalow. Is ____________ brother going to start ____________ uni course in Edinburgh next September? If ____________ parents get divorced ____________ will be very disappointed. Paul said that Paul’s mum stayed at Paul’s last night. Our family has got our family’s own traditions at New Year. My brother told me that my brother booked a table at my brother’s girlfriend’s favourite restaurant. Terry’s father was a fireman. Terry’s father worked in Alfreton. Terry’s father loved his job, because Terry’s father was very good at his job. Their daughter-in-law has baked a chocolate cake for their daughter-in-law’s son’s nursery school party. Their daughter-in-law’s son’s nursery play takes place tomorrow. Simon put his sandwiches on the side. Simon’s sandwiches looked delicious, but Simon couldn’t eat Simon’s sandwiches yet, because Simon was waiting for Simon’s sister Cecilia to appear.